T-Mobile and Google have always had a good working relationship with each other as far as Nexus devices go. The two companies are looking to keep that tradition going with the announcement that the Nexus 4 will be available on-contract through the magenta carrier by the end of this year. On November 13, T-Mobile customers will be able to purchase the Nexus 4 for $199.99 through Google Play and in-stores a day after. Google isn’t stopping the partnership there though, T-Mo will also be carrying the 3G Nexus 7 on their network as well. If you are looking to pick up the network enabled tablet it will go on sale through Google Play on November 5. You won’t have to wait too long to get your hands on the next iterations of Google’s flagship devices. Continuing to deliver on choice, value and amazing 4G experiences this holiday, T-Mobile USA, Inc. today unveiled its full lineup of smartphones, tablets and innovative services for the upcoming season. Featuring the latest cutting-edge products and services, T-Mobile’s portfolio offers the newest Windows Phone 8 devices, including the Nokia Lumia 810 and the Windows Phone 8X by HTC; the Google Nexus 4 with T-Mobile as a premier launch partner; and the Samsung Galaxy Note II featuring premium gaming experiences from world-class partners such as EA and MOGA™. Combined with T-Mobile’s Unlimited Nationwide 4G Data plan, T-Mobile’s portfolio is providing its customers with the devices, innovative services and 4G experiences they desire this holiday. The Nokia Lumia 810 is an exclusive to T-Mobile and offers access to T-Mobile’s fastest 4G network (HSPA+42), an enhanced camera with Carl Zeiss optics for crisp photographs, impactful design, integrated wireless charging via swappable back covers, navigation features and high-performance – all in a simple silouhette. The Windows Phone 8X by HTC is a premium Windows Phone 8 device that packs a punch with a beautiful 4.3-inch HD-resolution super LCD 2 screen, a powerful dual-core processor and fast speeds running on T-Mobile’s HSPA+42 network. Customers will enjoy the feel of the pure uni-body design in California Blue, access to Windows Phone’s Live Tiles, immersive studio-quality sound with Beats Audio™ and incredible camera capabilities of the Windows Phone 8X by HTC. T-Mobile will continue its history of providing customers the best Android devices available, including two of the newest options: the Nexus 4 and Nexus 7. 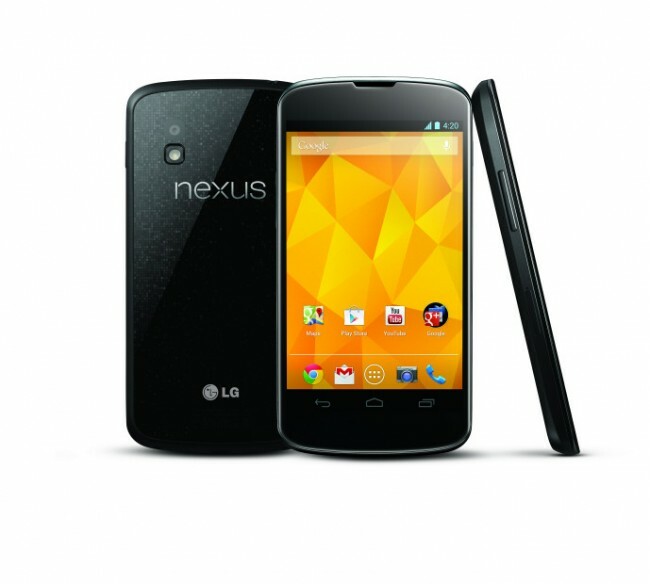 Nexus 4 is the latest device in the Google Nexus lineup and T-Mobile will be the premier U.S. launch partner. With cutting edge hardware designed collaboratively by LG and Google, favorite Google Apps, and the latest version of Android, Nexus 4 puts the best of Google in the palm of a customer’s hand. And, with access to T-Mobile’s fastest 4G (HSPA+42) network, T-Mobile is again giving its customers the best choice of devices. Nexus 4 comes with a high-performance 8MP camera and takes stunning Photo Sphere images to capture every detail of the world. The all new camera lets customers quickly view and edit photos with powerful new tools, and share favorite shots in a snap. When combined with T-Mobile’s Value plans or T-Mobile’s Unlimited Nationwide 4G Data plan, the Nexus 4 gives consumers a top-notch Android experience. With a stunning 7” display, powerful quad-core processor and all-day battery life, Nexus 7 was built to bring the best of Google in a slim, portable device. With a vibrant, 1280-by-800 high-resolution display, Nexus 7 brings apps, games, books and movies to life in stunning clarity. Over one million pixels in your hand means text is sharper, HD movies are more vivid and gameplay is smooth and dynamic. All of this is protected under scratch-resistant Corning™ Gorilla Glass and designed for the whole family to pass around and enjoy. Nexus 7 was built by ASUS and comes with a NVIDIA® Tegra® 3 quad core processor so everything is faster – pages load quickly, gameplay is smooth and responsive, and running multiple apps is a breeze. T-Mobile also recently announced the Samsung Galaxy Note II, giving customers a powerful all-in-one device with a 5.5 inch HD Super AMOLED® screen and a speedy 1.6 GHz quad-core, Samsung Exynos processor that are perfect for gaming, productivity, entertainment and more. For the value-conscious shopper, T-Mobile will offer the LG Optimus L9. Featuring a gorgeous 4.5-inch qHD Corning® Gorilla® Glass 2 display and equipped with a long-lasting 2,150 mAh battery, users can listen to music, explore the Internet or chat with friends and family for hours with just one charge. Further, T-Mobile will continue to offer the Samsung Galaxy S® III and Samsung Galaxy S® Relay™ 4G,rounding out a complete portfolio of powerful Android smartphones. Only T-Mobile provides its customers with access to the most innovative and compelling gaming experiences made possible with the exclusive content, devices and accessories gamers want paired with T-Mobile’s Unlimited Nationwide 4G Data plan. T-Mobile customers now can realize truly unlimited 4G gaming experiences – without having to worry about surprise bills or overage fees. T-Mobile will be the first U.S. carrier to preload EA’s Need For Speed™ Most Wanted game on the Galaxy Note II, including four free events. In addition, this T-Mobile exclusive version of the Need for Speed™ Most Wantedgame on the Galaxy Note II will be optimized to interact with a MOGA™ mobile gaming system, bringing an immersive, console-quality gaming experience to the palms of T-Mobile customers’ hands. Further, T-Mobile will offer a new social gaming destination which will directly connect customers to Zynga games right from their device homescreen. The Zynga games destination will feature With Friends games, is pre-loaded on the Samsung Galaxy Note II and LG Optimus L9 and will be accessible via the Bonus Apps widget on several other Android devices this month. Addtionally, only at T-Mobile, new and existing owners of the Samsung Galaxy S III will receive “Marvel’s The Avengers” – the number 1 movie of the year and 3rd biggest release of all time – as a virtual preload, available for download in the Samsung Media Hub. Taking advantage of T-Mobile’s Unlimited Nationwide 4G Data plan, customers can download unlimited video content, such as “Marvel’s The Avengers,” on our nationwide 4G network without having to worry about data caps, speed limits or overages. 1Device Pricing on Value Plans: For well qualified buyers on approved credit; 0 percent APR. Down payment and unfinanced portion required at purchase. Samsung, Galaxy, Galaxy S, Galaxy Note, and Super AMOLED are trademarks of Samsung Electronics Co., Ltd. Other company names, product names and marks mentioned herein are the property of their respective owners and may be trademarks or registered trademarks.